Last week's Storage Valley Supper Club provided an update on developments in solid state memories. First, the incumbent technology, planar flash, has reached the end of its development path at the 15nm generation. Planar flash will continue to be the majority of flash bits shipped through 2018, but the current generation is the last. Second, all the major flash manufacturers are now shipping 3D flash, the replacement for planar. Stacking the cells vertically provides much greater density; the cost is a much more complex manufacturing process and, at least until the process is refined, much lower yields. This has led to much skepticism about the economics of 3D flash, but it turns out that the picture isn't as bad as it appeared. The reason is, in a sense, depressing. It always important to remember that, at bottom, digital storage media are analog. Because 3D flash is much denser, there are a lot more cells. Because of the complexity of the manufacturing process, the quality of each cell is much worse. But because there are many more cells, the impact of the worse quality is reduced. More flash controller intelligence adapting to the poor quality or even non-functionality of the individual cells, and more of the cells used for error correction, mean that 3D flash can survive lower yields of fully functional cells. The advent of 3D means that flash prices, which had stabilized, will resume their gradual decrease. But anyone hoping that 3D will cause a massive drop will be disappointed. PCM SSD with less than two microseconds round-trip access latency for 512B reads, and throughput exceeding 3.5 GB/s for 2KB block sizes. which, despite the near-DRAM performance, draws very little power. But the big announcement was Intel/Micron's 3D XPoint. They are very cagey about the details, but it is a resistive memory technology that is 1000 times faster than NAND, 1000 times the endurance, and 100 times denser. 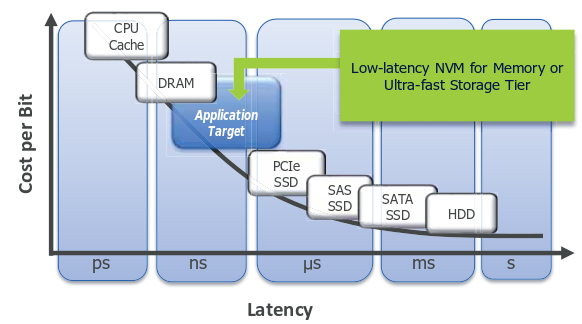 They see the technology initially being deployed, as shown in the graph, as an ultra-fast but non-volatile layer between DRAM and flash, but it clearly has greater potential once it gets down the price curve. My old friend Dr. Pangloss was missing in action at last week's Storage Valley Supper Club, where the assessments of the future for solid-state storage were quite sober. But apparently he attended the Flash Memory Summit that preceded the dinner. For a taste of the Panglossian view, try Brian Barrett's hype-fest The Flash Storage Revolution Is Here. More information on XPoint from The Register - it is a form of resistive RAM (ReRAM). Much more discussion of 3D VPoint, mostly about how little we know about it from Tom's Hardware and a 3-part series at StorageIO - one, two, three. HP and SanDisk just announced something like 3D Xpoint based on memristor/ReRAM technology.